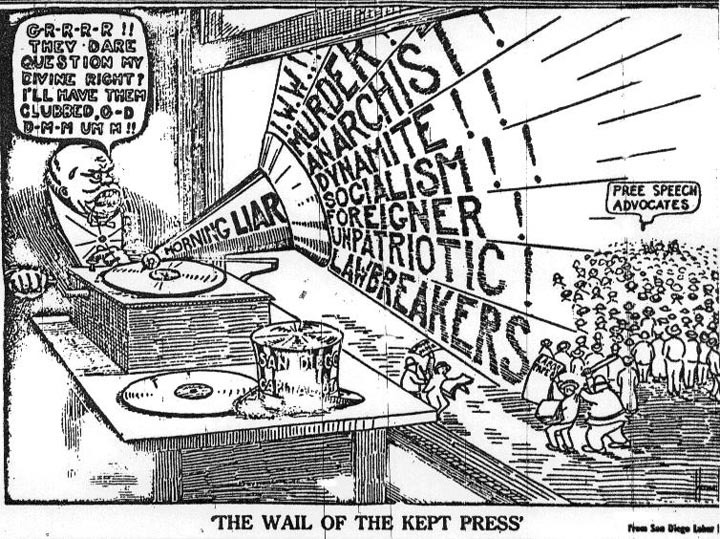 'The Wail of the Kept Press' by unknown artist, Industrial Worker, April 11, 1912. 'The Wail of the Kept Press' appeared on the cover of the Industrial Worker at the height of the San Diego free speech fight. In this cartoon the artist accuses the mainstream press of being nothing more than the mouthpiece of capitalist interests. The establishment newspapers were never friendly to the cause of labor, however during the free speech fights they were downright fanatical in their invective against the IWW. Editorial after editorial painted pictures of bearded, bomb-throwing anarchists and lawless foreign conspirators who should be tortured, shot, or hung. The press was instrumental in whipping up the mass hysteria which led the Wobblies to become victims of unspeakable acts of mob violence. In San Diego, detained Wobblies were turned over to waiting mobs in the cover of night who whisked them to the county line where, according to eye-witness accounts, they were ordered never to return again after being forced to kiss the flag, sing the national anthem, and then run the gauntlet between two rows of vigilantes beating them with clubs and spades. See this image in the Solidarity Forever: A Look at Wobbly Culture exhibit.